« The “boutique Iliad”, or Smash the State? Or both! This is by far one of my favourite houses in Vancouver. 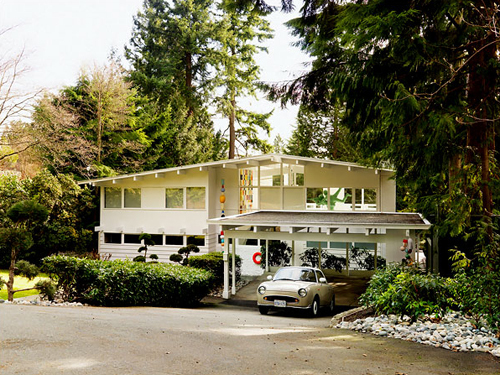 It’s in the municipality of West Vancouver, home to many of the best modern houses in the city, and it belongs to the novelist Douglas Coupland. He grew up in West Vancouver, not far from this house. Just as beautiful as this place is the house below it, a beautiful midcentury modern post and beam house designed by the architect Ron Thom. That’s the house Coupland actually lives in with his architect partner David Weir. Coupland is an artist and designer as well as a writer, and the house shown here serves as his gallery, guest house, and many other things. 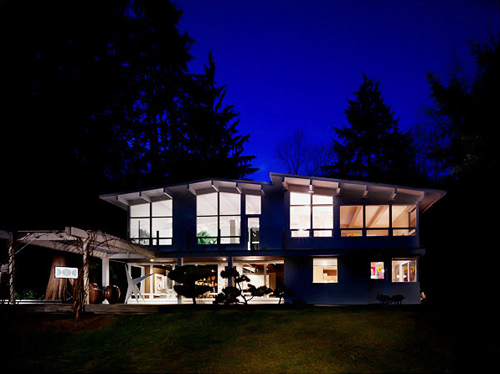 One of the reasons Coupland bought a second house is that the rate of demolition of midcentury modern houses in Vancouver is accelerating, and he wanted to preserve what was in his own back yard. Everything in the house is original – the flagstone floor, the carport, the railings. Lastly I’m sure it’s partly my visual OCD or some pyschedelic tendency, as well as of course their beauty, but his collections of shapes and objects are completely mesmerizing to me. 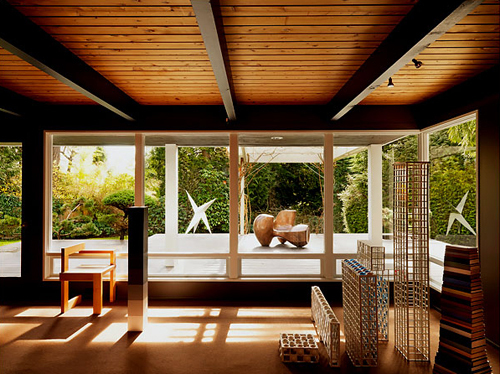 Spools of thread, lego, polyhedra, modernist vases: I’m fixated. There are informative captions on the NYT blog – click on photos to go there (or link at bottom), and see my previous post on Coupland here. The fantastic photos are by Vancouver photographer Martin Tessler for the New York Times. “The house, to me, is all about modularity and building kits,” [Coupland] said, referring to the vintage building kits that he collects. 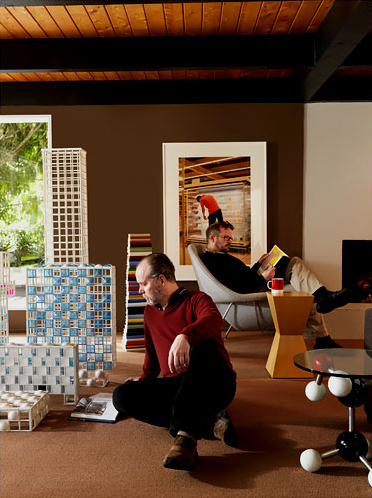 Here, he applies white Lego building blocks to a post in an upstairs gallery space, where his “Target Stack” installation hangs on a wall. He installed a number of art works throughout the house, including many of his own creations. His “Downy Fabric Softener” sits in a hall before a Brian Howell photograph. The flagstone floor is original. 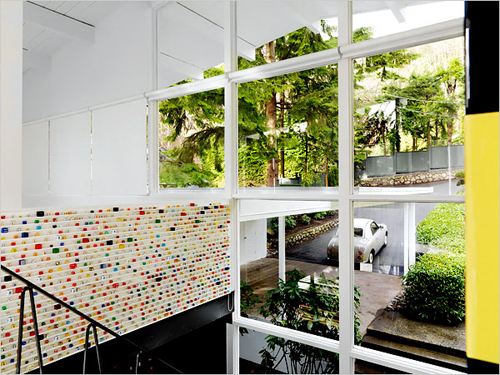 Other original details include the glass entryway, where he has installed dice as an ode to the artist Damien Hirst’s pill paintings. In the dining room, a Mousetrap game sits on a table. “It becomes this amazing sculpture you can get for $3 at a flea market,” Mr. Coupland said. The table is by Alberto Meda for Alias, with Eames chairs around it and a Nelson lamp above. A shelving unit displays building-kit pieces. Spools of thread are on display as they would be in a tailor shop, another nod to Mr. Hirst’s work. When guests come over to the house Mr. Coupland invites them to pull on the string. 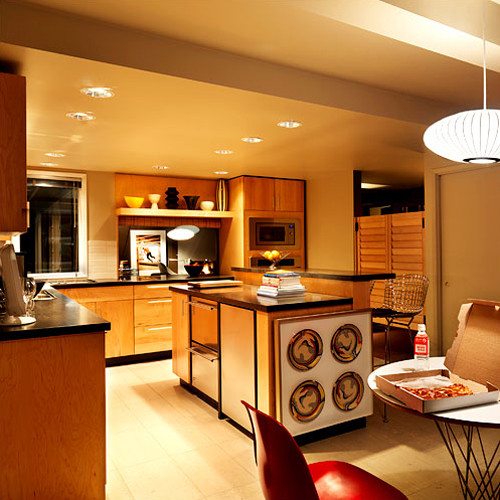 The kitchen features maple cabinetry throughout. A Roy Lichtenstein print of paper plates hangs on one end of the island. A photograph by Denis Darzacq hangs on a wall in the living room, behind buildings made from a ’60s kit called Super City. Mr. Coupland’s partner, David Weir, seated in the chair, shares the homes with him. 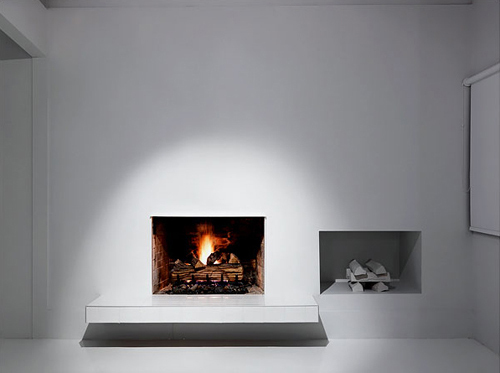 A minimalist fireplace and a nook with ceramic logs occupy an otherwise blank wall in the living room. Mr. Coupland made his bathroom “embody the best of what I like in hotel bathrooms.” The sleek tub is by Acri-Tec. 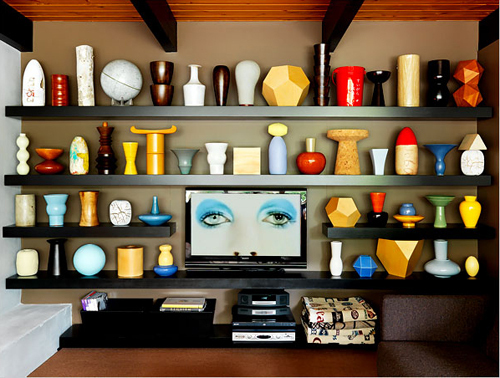 “I collect shapes,” Mr. Coupland said. A globe of the Moon, a metal watering can and an assortment of vases and other objects line shelves. This entry was posted on Wednesday, August 26th, 2009 at 1:33 pm	and is filed under design. You can follow any responses to this entry through the RSS 2.0 feed. You can leave a response, or trackback from your own site. Doug is so on the ball…his whole world is a creative adventure.